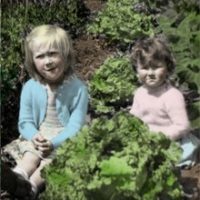 My sister-in-law was showing me the garden of their new home, including a number of fruit trees. Unfortunately, the foliage of the two pear trees are covered in red lesions, and the underside shows the clear signs that something is seriously amiss. 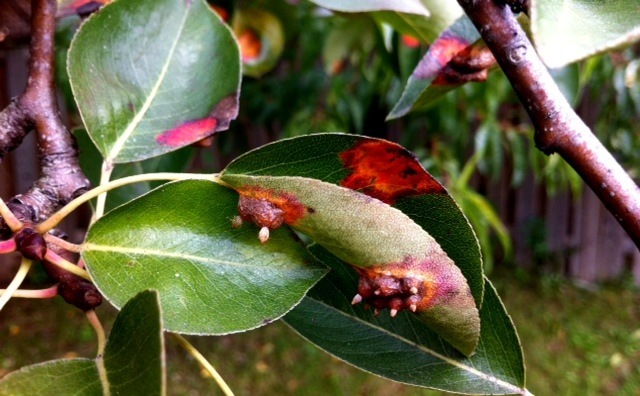 The problem is Pear Trellis Rust – with info from OMAFRA, and this from the Toronto Master Gardeners – and the extent of the infection on her trees suggests that these two are goners. Treatment includes pruning out infected branches – far too many to count in this case – and removing the host plant, which again is Juniper, from within 100 metres to 1 kilometre – totally impossible in an urban setting. This rust is from the Gymnosporangium fungus family responsible for the Cedar Apple Rust we wrote about back in July, as well as rusts on other rose-family members such as hawthorn and quince. Likely, the wet weather early in 2011 contributed to the spread, but my guess is that these fellas have been suffering from this rust for more than one season. Which goes to show: keep an eye on your precious woody material to catch problems early. The most important aspect of control for you and your neighbours is to monitor the host Juniper for telltale galls and orange, gelatinous fruiting bodies after a rain in spring. This excellent fact sheet from Connecticut’s department of agriculture [PDF] shows you what to look for. It ain’t pretty, but it’s best to know. Ugh, one more garden problem but the warning is a good one. I hope they survive. I know some years are worse than others with cedar/apple rust depending on, as you say, the weather. I lost two crab apples to something like this about 8 years ago. But two other crabs I couldn't bear to cut down weathered the disease. There was one spring that they didn't flower at all, and quite a few Augusts when they lost all their leaves early. They're still infected, but they're coping with it. Flowering beautifully, growing well. Thanks for all the info. Fascinating!